Catchy subject line, check. Attention-grabbing hook, check. Active email recipient list, check. Convincing images, check. Clear and direct CTA, check. After time spent, edits, and revisions – you’re ready to hit send on the email campaign. But, how would you feel if it doesn’t even make it to your audience’s inbox? Email deliverability is extremely important to marketers. It remains a cost-effective resource that drives conversions – especially for those that share highly optimized and personalized campaigns. The goal is to produce email campaigns that your audience finds interesting enough to open and click through. Unfortunately, that task is not as easy as it sounds. Even the most perfectly planned and executed email campaigns can accidentally end up in the spam folder. Over the years, email clients like Gmail and Outlook have placed a variety of strict spam blockers to benefit the user experience. However, some of their efforts can also accidentally block some of your campaigns from ever even hitting the recipients inbox. Generic link shorteners are used by millions of people every day. In recent years they have been associated with spam, given that spammers can use them as a veil to conceal malicious links. Since you can’t see where the link leads when you click a generic short url, the service can often be misused by shortening harmful links. By now you’re probably thinking, I’m a marketer though, not a spammer. However, since you’re using the domain of the URL shortener, you’re grouped in with any spammers also using the service. If they create spammy links that are blacklisted, your links, unfortunately, may be as well. Enter branded links for emails. 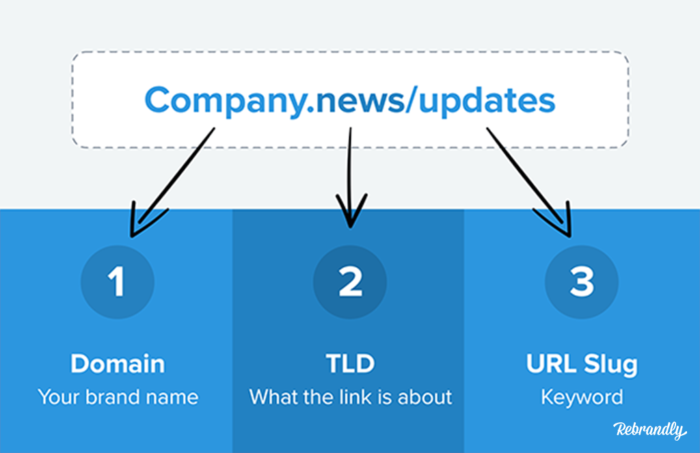 A branded link is a shortened link that includes your brand name, what your company does, and describes where the link leads. When you use a branded link, you own the domain so there is no chance you can be associated with spam, unless you are a spammer, that is 👀. Using branded links not only prevents your email from being sent to spam- but can actually lead to an increased open rate. These links create trust because the user knows exactly where the link will lead before they decide to click it. If you’re using a link management platform like Rebrandly; creating, tracking, and analyzing branded links for your email campaigns and other activities can easily be done in one place. 2) You’re using phrases that trigger spam defenses. Even with the best intentions, it’s easy to accidentally use spam trigger phrases in email campaigns. Although spam filters are getting more advanced every year, it’s still good to avoid certain phrases in your subject lines. Since it’s nearly impossible to completely avoid using these words and phrases, there are a few tools on the market that will do this for you. If you paste the copy of your email into Postmark, you’ll receive a spam score, indicating if anything that is written will trigger spam filters. 3) You’re not fully optimizing your sends. Since every email platform also gives the option to “mark as spam,” users can easily report irritating or unwanted emails. Monitor the number of times your messages were marked as spam in your email reports. No matter how great your email sends are, odds are that on occasion some will be flagged. Receiving a significant number of flags can result in blacklisted emails in the future. Only contact people that have signed up to receive emails from you. All emails should have the same look and feel to prevent confusion and increase email recognition. If your audience recognizes and trusts your brand, the lesser the chance they will unsubscribe or mark your email as spam. Instead of forcing your audience to mark emails as spam, provide an unsubscribe button. Not only does this benefit the user experience, but it’s also the law. There is anti-spam legislation in place in America (the CAN-SPAM act) that requires an unsubscribe button to be added to every email. If you don’t follow this practice, you’re susceptible to hefty fines. It’s also best practice to include the unsubscribe option at the bottom of emails, rather than the top. A way to gain more information about the reasons why a person chose to opt out, is to request their answer in a short survey. This will provide you with feedback on how to improve future sends. If you’re sending emails to people that want to read them, you inherently reduce spam complaints. Ensure to segment your list to prevent people from receiving your emails when they are no longer interested, and to send the best emails to the right people. 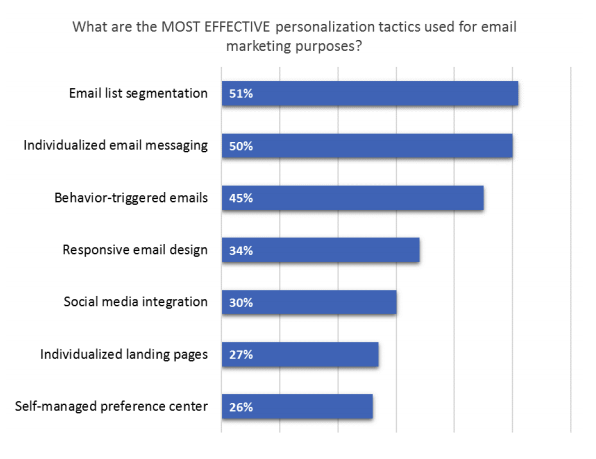 Research from Ascend2 proves that marketers agree that personalization tactics are incredibly effective in email marketing campaigns- with most of them finding these two strategies to be the most important. It’s difficult building email lists to begin with, and once you start growing them, cleaning them can easily get pushed to the back-burner. It’s beneficial to go through your email lists every few months and isolate contacts that never open your messages. The next step would be to create some type of reengagement drip campaign to try to entice them back in. For the contacts this reengagement strategy was not impactful for, the next step would be to remove them from your list. Don’t worry about losing some contacts, this will benefit your overall strategy and will reduce the chances of your messages landing in spam folders. After removing these inactive subscribers, expect a spike in overall open rates and engagement, which benefits your relationship with email providers. For more tips on the benefits of unsubscription, and how to build stronger lists, check out this article. 5) You’re not tracking or focusing on email engagement. Sends with high engagement rates indicate your audience is enjoying the content that they’re receiving. To monitor these rates, look at metrics for click-throughs and conversions. Click-through rates have the greatest impact on email deliverability. Email providers are looking to deliver highly engaging emails to their clients, and this is measured by the rate they are opened and interacted with. Emails with low open and click-through rates also have an increased chance of being sent to the spam folder. Increase engagement by constantly keeping your audience in mind when developing an email strategy. Focus on ways to increase open rates first, and second on crafting compelling CTAs within the text to increase click-through rates. Marketing emails face a high competition in inboxes. The subject line is your chance to differentiate yourself from the competition, and acts as the gateway to all other email engagement rates. Almost half of all emails are thrown out immediately based solely on the subject line. Also, take the time of the send into account. Ensure that the time of the send is in line with your audience’s preferences and schedules, as certain times of the day are more optimal than others. If your target is, for example, those that work in hospitality, its best to target them on less busy days like Monday and Tuesday rather than on a Friday night. Most of the reasons your company’s emails have been landing in the spam folder are completely unintentional, which is why it’s so important to educate yourself and your team on spam triggers, like the five or outlined in this article. 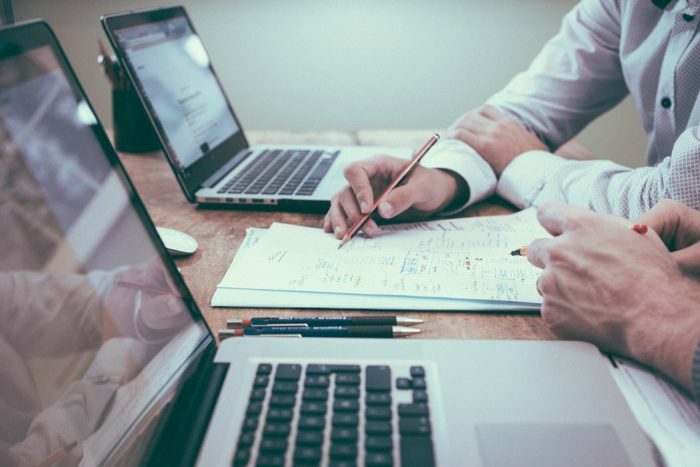 Consider these tips when planning your next campaign and increase email deliverability while improving your customers’ experience.